Don't call it a comeback, but door-to-door milk deliveries are on the rise. As operations manager for Local Farmers Delivery, McDonald dispatches trucks full of milk to homes throughout Portland, Oregon. The company also delivers a few staples, like bread and eggs, and is focused on milk delivery. Delivery persons even wear the traditional all-white uniforms of yore, with a neat bowtie and cap. Since milkmen started making door-to-door deliveries to local neighborhoods earlier this year, McDonald has raced to keep up with demand, which more than tripled in the first three months. Most milk trucks disappeared from the landscape in the 1960s, making the milkman a relic of black and white TV shows and vintage advertising posters. Until now. As a growing number of small dairies reintroduce home milk deliveries, the milkman is making a comeback. “It’s a wholesome product from a local farm that reminds people of how things used to be,” says Andy Gutierrez, operations manager for Longmont Dairy in Longmont, Colorado. Longmont Dairy is a rare dairy that has continuously delivered milk to customers since its founding in 1965. Within 24 hours of milking a herd of 500 Holsteins, a team of 30 milkmen is dispatched to deliver bottled milk to 20,000 customers statewide. In the first two months of operations, Local Farmers Delivery signed up more than 100 customers in Portland; McDonald believes “thousands more” will be accepting deliveries from milkmen as word of the service spreads. “It’s a convenient way for people to support local farms,” explains McDonald. 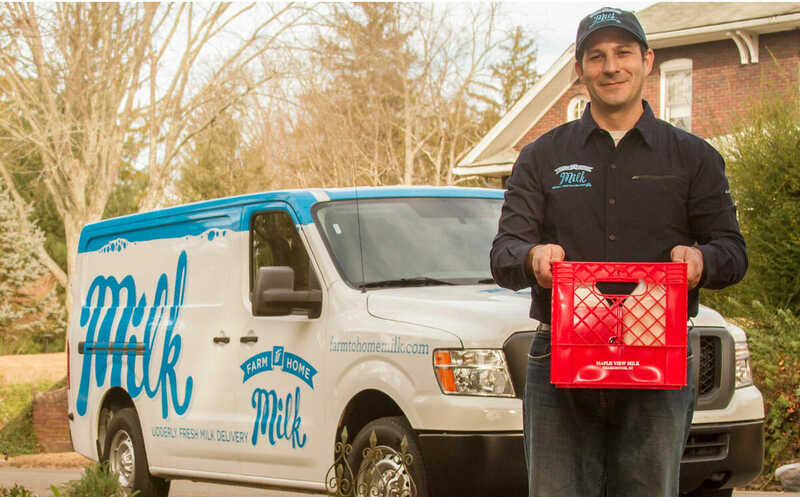 The excitement over home milk delivery was so high that South Mountain Creamery in Middletown, Maryland, had to establish a waiting list and, earlier this year, temporarily stopped accepting new applications because their milkmen can’t keep up with the demand. Unlike much of the milk sold at the supermarket, which is sold to a co-op, mixed with milk from several farms and bottled under a national label, most milkmen deliver milk from a single dairy. But it’s not just traceability that has customers raving about milk deliveries. Gutierrez believes the “superior taste” is a combination of the freshness of farm-to-front porch milk combined with the iconic glass bottles, which, unlike plastic, don’t impact the flavor of the milk. “You can definitely taste the difference,” Gutierrez says. Although the concept is catching on, modern milkmen aren’t as ubiquitous as they were when the Cleavers were raising Beaver. Despite a thriving farm to table movement in Asheville, Jonathan Flaum is the only milkman in town. The first time he approached local dairy farmers with the idea of partnering for home milk deliveries through his business, Farm to Home Milk, the reactions were mixed; one former dairy farmer questioned whether it was possible to make a living as a milkman. “He told me that he got out of [delivering milk] because it wasn’t profitable,” Flaum recalls. But the farmers at two North Carolina dairies, Maple View Farm and Country Wholesome Creamery, were intrigued. Both are small dairies ”“ together the dairies milk 200 Holsteins ”“ and the farmers were eager to expand their direct-to-consumer operations. The interest in sourcing foods from local farms is the main reason small-scale dairies introduce the service. Flaum’s new career as a milkman has taken off. Demand for home milk deliveries has doubled in the last year; Farm to Home Milk delivers to more than 180 homes across Asheville. The interest in sourcing foods from local farms is the main reason small-scale dairies introduce the service, according Flaum. Unlike the milkmen of yesteryear, Flaum delivers eggs, butter, bread and other staples from local producers as well as fresh milk. “The delivery method hasn’t changed since 1955 but modern milkmen have a lot more products on their trucks,” he says. Even though it takes him longer to make deliveries, Flaum welcomes the chance to talk to curious neighbors who have a lot of questions when he drives up in a vintage milk truck and leaves coolers filled with bottled milk on neighborhood front porches.